Since gaining independence from the U.K. in 1973, the Bahamas government has maintained the same form: a constitutional parliamentary democracy. Governor General -- Arthur Dion Hanna, Sr.
prime minister (head of government), and cabinet. Political parties: Free National Movement (FNM), Progressive Liberal Party (PLP), Bahamas Democratic Movement (BDM). Suffrage (2007): Universal over 18; 150,689 registered voters. The Bahamas, a member of the Commonwealth of Nations, is a constitutional parliamentary democracy with regularly scheduled elections. As a Commonwealth country, its political and legal traditions mirror the United Kingdom’s. The Bahamas holds the British monarch as its nominal head of state, with an appointed Governor General serving as the monarch’s representative. A two-part legislature enacts laws under the constitution. The lower house, the House of Assembly, consists of 41 members elected from for terms of 5 years. The House of Assembly performs all major legislative functions and can dissolve the Parliament and call elections at any time. The leader of the majority party serves as prime minister and head of government. The cabinet, which answers to the House of Assembly, contains nine or more people, including the ministers of executive departments. 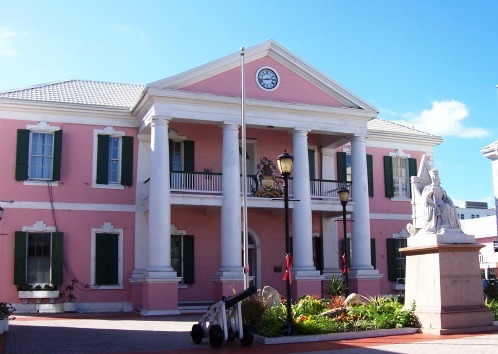 The Senate of the Bahamas government consists of 16 people who are appointed by the Governor General. Nine of these senators are chosen on the advice of the prime minister, four on the advice of the Leader of the Opposition, and three on the advice of the prime minister after consulting the Leader of the Opposition. The Governor General appoints all of the Supreme Court justices. He or she chooses the Chief Justice of the Supreme Court after consulting with both the prime minister and the Leader of the Opposition. The Governor General also appoints the other justices on the recommendation of a judicial commission. The Privy Council of the United Kingdom serves as the highest appellate court. Local government districts elect councils for localized issues, such as town planning, maintaining government buildings, traffic issues, and business licenses. In some of the larger local districts, additional lower level town councils have other minor responsibilities.